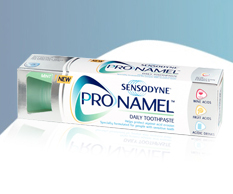 Sensodyne Pronamel | Glaxosmithkline Plc. Brushing twice-a-day with ProNamel may help to restrengthen the softened enamel layer, increasing resistance to acid attack. ProNamel also provides relief for sensitive teeth.